On Thursday 3rd December 2015, a mother and son from Lichfield received a lifetime ban from keeping equines. Katrina and Liam Till had both previously (Tuesday 24th November 2015) been found guilty of offences relating to Animal Welfare Act, which included failure to explore and address the horses’ poor body condition, failure to provide adequate diet, failure to provide sufficient worm and lice control, and failure to provide adequate foot care. 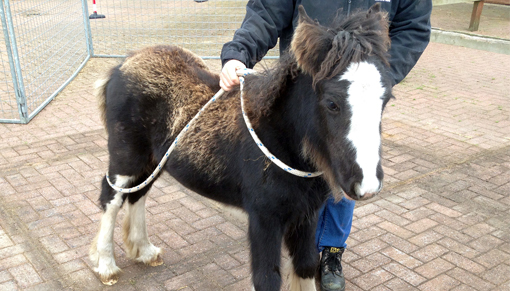 Our team assisted the RSPCA with the rescue of the horses on two separate occasions. 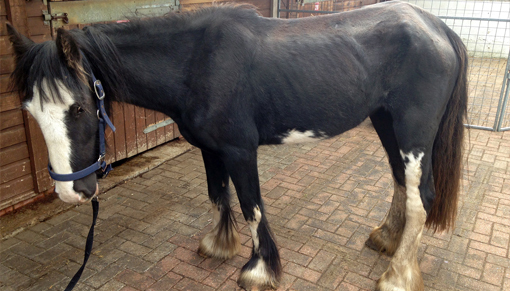 On 3rd October 2014, two-year-old 13hh piebald cob Bella was removed from a field in Staffordshire, and then 20-year-old 14hh palomino cob cross Holly was later seized on 19th December 2014. Both mares were seized on veterinary grounds having been discovered in very poor condition – Bella was body condition score 1 and Holly 0.5. Similarly, in both instances the mares were found with foals at foot who were also removed because they were still dependent upon their mothers. Following their rescues, Bella and Holly were initially cared for at our Oxhill centre while their cases were investigated by the RSPCA. 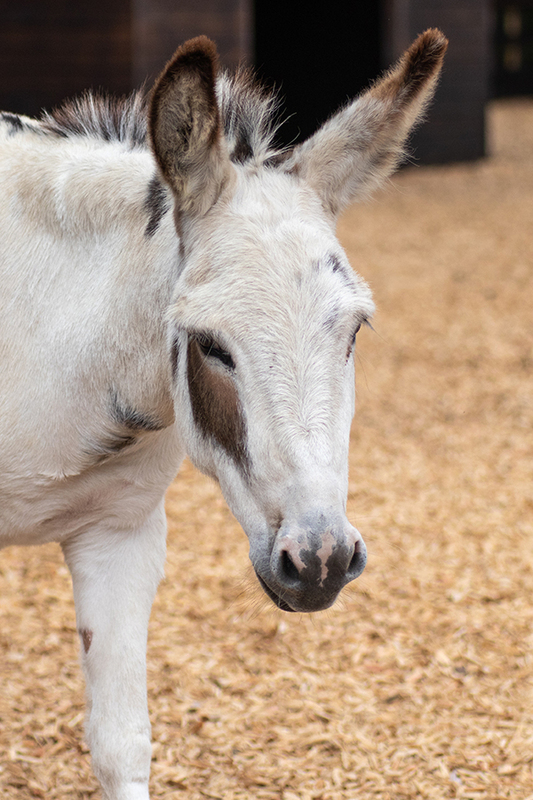 Bella began to show signs of improvement, being bright and alert, and eating well; however, within three months of her rescue she began to lose her appetite and struggled to maintain her weight. Suspecting liver compromise, Bella, together with her foal, was moved to our Horse Hospital in Norfolk for a liver biopsy and blood tests, which sadly confirmed serious liver disease. Despite our veterinary team’s best efforts to combat the disease, Bella’s liver was damaged to such an extent that we had no option but to seek permission from the police to put her to sleep in February 2015. Bella left behind her foal “Arabella”, who we named in memory of her mother. 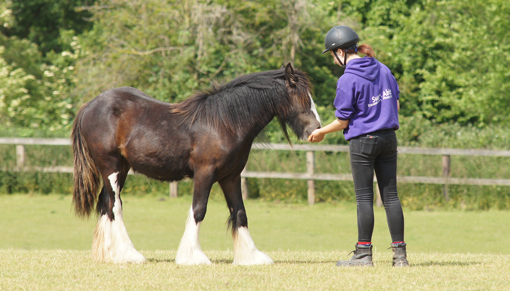 Holly arrived at Redwings Oxhill as a severely underweight and unhandled mare, displaying wild, frightened behaviours. Holly and her foal were transported to our quarantine centre in Norfolk where we have the facilities and veterinary and behavioural expertise to assess and treat unhandled horses. As well as being incredibly malnourished, Holly was suffering from worms, lice and a lack of dental care. Similarly to her field mate Bella, Holly only improved partially before we uncovered evidence of liver disease. The disease was so serious that despite best efforts to support her liver, Holly’s condition continued to deteriorate with rapid weight loss and loss of appetite, and sadly she was put to sleep in March 2015. As with Bella, Holly left behind her foal, seven-month-old Savannah. “We’re very pleased with the guilty verdict and sentencing of Bella and Holly’s owners,” continues Redwings Head of Welfare and Behaviour Nicolas de Brauwere. “But as with so many welfare cases we see, this should not have happened to these mares in the first place. “We believe their liver disease was as a result of ragwort poisoning; as they were not provided with suitable grazing or an adequate diet, it is most likely they would have consumed ragwort in their field. Holly’s foal Savannah initially displayed similar symptoms of liver compromise as shown by her mother and Bella, but as this has been caught early we’re very hopeful for her future. 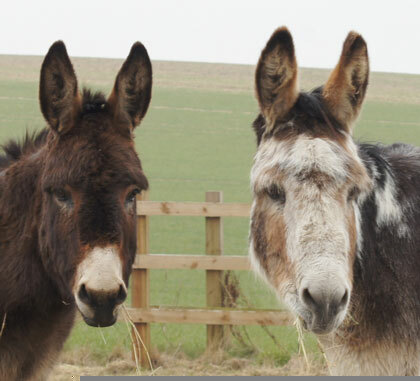 “It’s very upsetting that in both cases Bella and Holly responded well in the early days after their rescue – having been given the basic care and nourishment they were so desperately lacking from their owners – but then went downhill so rapidly. Their case is extremely upsetting, but we take some comfort in that justice has been served for the mares – and for their foals”. Liam Till was disqualified from keeping equines for life and received a suspended prison sentence, community order for 18 months and £750 costs. Katrina Till was also disqualified from keeping equines for life and received a community order for 18 months, plus £750 costs. 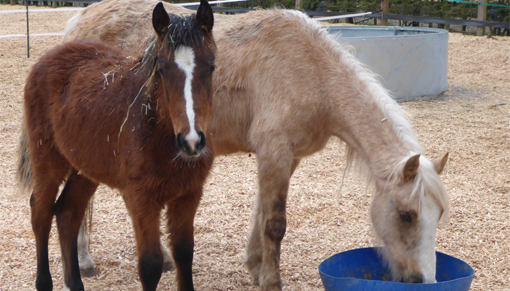 Both received a confiscation order regarding the two foals. For more information about Ragwort, click here.